The last day at Jeddah was also the only working day for Saudi Arabia during our stay here. All the Calls were thus planned on 31st May. First one being the Call on Director General Jeddah Islamic Port. Trade relations between the two nations, growing importance of commercial ports in Red Sea and IOR region and ever-increasing implication of sea trade were discussed during the Call on. This was followed by a Call on Director Coast Guard. Issues pertaining to strengthening of Indo - Saudi defense relations, increasing importance of coastal surveillance and conduct of bilateral exercises were discussed. 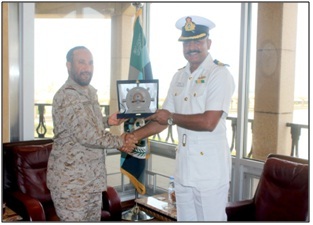 As Jeddah is also home to the Western Fleet of Royal Saudi Naval Force, next visit was to the Head Quarters of Western Fleet followed by a meeting with the Fleet Commander. During the interaction, the involvement of RSNF and IN ships in strife torn YEMEN, the role and importance of sail training ships and India’s growing ship building capability were discussed. The Commanding Officer, Navigating Officer and Engineer Officer along with some of the crew visited HMS Al Hafof. 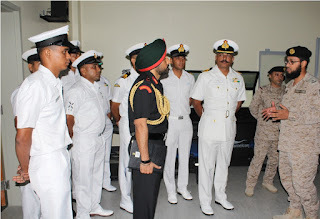 The Commanding Officer along with two officers and five sailors visited Naval Technical Centre at the Naval School. A brief about the organisation, training facilities and training methods was presented. 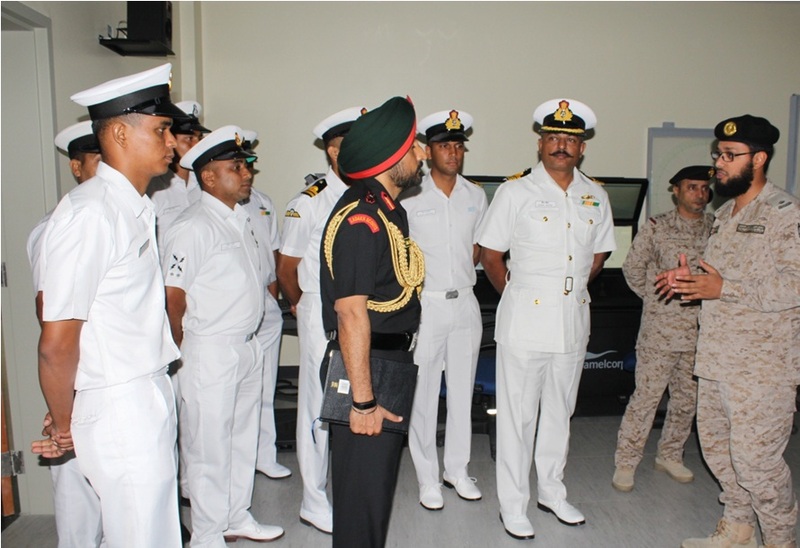 The crew was shown Maritime warfare and Helo controller simulators and various training facilities at the school. The Crew, thereafter, visited Naval Professional School. A brief about the organisation, training facilities and training methods was presented. 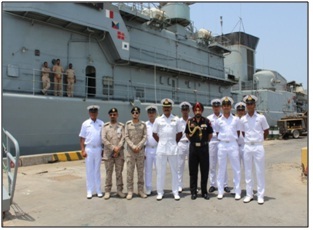 In addition, a delegation of 15 RSNF Officers headed by Director of Operations Western Fleet visited the ship on 31 May 15. 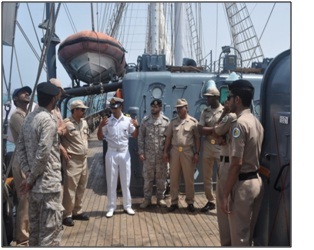 Lt Kshitij Sharma, the Rigging Officer of the ship took them around the ship and briefed them about the role and importance of the Sail training ships. The ship was open to school children from 1000 to 1130 hrs. A total of 180 school children of Class X along with six teachers from Indian International School visited the ship. The children were shown around by Mast In Charges followed by a sail setting demo. The students enthusiastically participated in all the activities and were keen to find out how they could join as a crew of this ship. The Calls and visits concluded with a Lunch in the sprawling and elegant Officers’ Club. 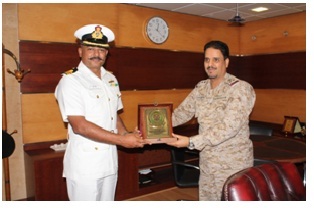 Senior Officer Frigate Squadron alongwith Commanding Officers of Al Hafof and Al Riyadh hosted the event. Sumptuous Saudi cuisine was spell binding for most. Because, while the vegetarians (NO, EO and Sea I Chauhan) had to make do with some pita bread and salad, the non veg section saw minimal conversation. There was also this somebody senior from the crew whose fondness for Homus came to light as he was seen adding it to everything but Kahwa.